When you reach inside your turkey, you’ll find a goody bag that your dog will go crazy for. If you’re not using the giblets to make soup, stuffing or gravy, don’t throw it away – use these tips to start a new Thanksgiving tradition. The turkey’s neck is made up of small, lightweight bones that are easy for most dogs to crunch up into tiny pieces, easily broken down in their acidic stomach. It’s a wonderful source of calcium and cartilage – excellent for active dogs and senior dogs with arthritis. It also helps clean your dog’s teeth – I call it Nature’s Toothbrush! However, if your dog does not normally eat raw bones – and even if she does – you will need to supervise her while she eats it to make sure she does not choke. The neck is, after all, neck-shaped, meaning it can lodge in your dog’s windpipe if she gulps it down too quickly. You can hold one end while she chews to make sure that she does not try to swallow it whole. You can also freeze it the night before Thanksgiving morning. If it’s frozen, she will have to slowly tear away pieces of the neck. This year, I gave Cow a frozen neck for Thanksgiving breakfast, though she has eaten it raw. Remember: cooked bones are dangerous. “Cooked” includes boiled, steamed, fried, baked, even dehydrated, freeze-dried and smoked bones found at your pet supply store can be dangerous. Cooking causes the structure of the bone to become hard and splintery. Do not cook the turkey neck before you feed it, and do not let your dog have any turkey bone after cooking. For dinner, pieces of white meat without visible fat or skin is totally fine. For Cow, a turkey neck is almost twice the weight of her average meal, so it’s a feast, but it’s not too much for her to handle. She’s about 27 pounds. If I had two turkey necks, I’d chop one into chunks and give it to Matilda over a few weeks. The pieces would need to be about the size of her head or bigger to encourage her to rip off small pieces instead of trying to swallow the whole chunk. I would definitely freeze it for her to slow her down because she is a wild eater. As with any raw meat, wash your hands after handling, as well as any surface the meat touches. 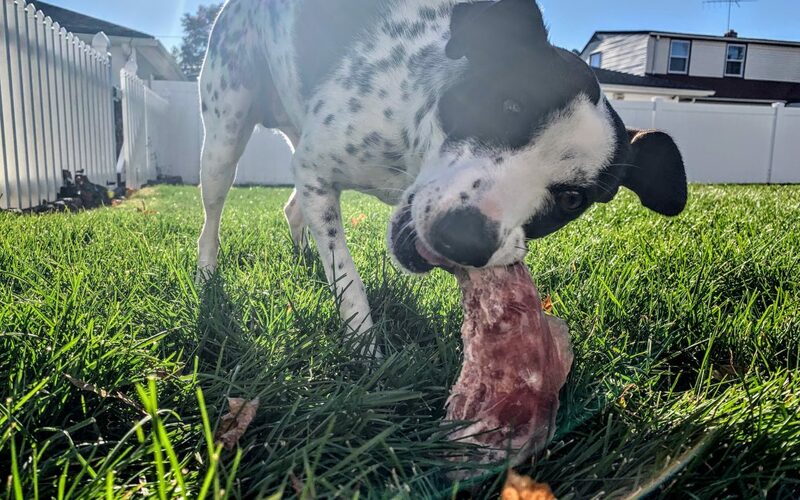 Most dogs can handle raw meat because they have a short, acidic digestive tract that keeps bacteria from festering in their body long enough to make them ill. If your dog normally eats kibble or other processed food, the turkey neck can make them sick because they are not used to it. However, I used to give Cow the turkey neck when she ate kibble and she was fine. Don’t want to feed the turkey neck? Use it to make bone broth! The little bag you pull out of your turkey will probably contain the liver, heart and gizzard of the turkey. These are all safe and nutritious to feed. You can feed them with the neck. For Cow, the neck was a feast, so I’m going to give her the giblets with her dinner. Some dogs do not like organ meat. You can sear it quickly in a pan to make it more tempting, but there’s no need to cook it through. Organ meat is rich – too much can cause diarrhea, especially if your dog is not normally raw-fed. The giblets that come with the turkey would be too much for one meal if your dog is under 20 pounds. Matilda will choke if I give her a chunk of boneless meat that she thinks she can swallow. So for her, I’m going to have to mix tiny pieces into the rest of her food. Why Do We Waste Those Wonderful Giblets? Before I started feeding my dogs raw food, before they were even born, I remember how my mom would throw away the giblets every year. Most people do this, and now I know that it’s such a waste! Organ meat is rich in vitamins. It’s typically a little bitter, but cooked right, it can be tasty, and so good for us humans. For dogs, it’s an essential part of any raw diet. If you can, ask around and see if you have any friends or family members who will let you take their giblets. In my opinion, they’re the best part of the turkey! I have two half breed chihuahuas and I’ve been feeding them a raw food diet for just over a year now. My oldest boy Chico is 13 now and just developed a bladder infection and possible stones and or crystals. I have to get exrays done to know for sure but the vet tested him urine and confirmed the bladder infection. The vet tried to tell me I shouldn’t be feeling raw meet to my dogs because they don’t take well to it and said the glands in his neck are swollen and this is likely why. I’m worried about him and wondered if you could offer up any advice on this problem ? I am really upset about the thought of loosing him, he’s been on pills for 3 days out of 10 and still only urinating in a dribble form. Please help me if you can. I’m real desperate for advice, thank you. Hi Lisa, I definitely cannot give you advice as I’m not a vet, but you should seek a holistic vet ASAP. There’s so many variables here, depending on what kind of raw food you feed and what kind of stones your dog has. I don’t think it makes sense for your vet to come to the conclusion that your older dog’s recent health issues are due to a raw diet that they’ve been doing well on for a year, but anyway… I’d definitely seek a second opinion fast.